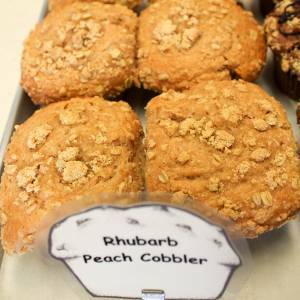 Now before you start thinking that Frank ruined a perfectly fine Peach Cobbler muffin by mixing in some leftover celery he accidentally stained with beat-juice, you might reconsider this thing called RHUBARB. Yes it’s a plant, but it’s a delicious plant with a bitter, sour, sweet compendium of tastes. Practically a triple threat. Where else will you find that? Broadway? Broadway in a muffin? If anyone could do it it would be Frank, but don’t let’s be ridiculous. I think Rhubarb Peach Cobbler is enough.